FATALE, the critically lauded horror crime noir by Ed Brubaker and Sean Phillips, continues its overwhelming popularity as its much-anticipated second issue has sold out at the distribution level before it is even in stores. FATALE #1 also sold out, despite a generous overprinting, and a second printing of that issue - which also has sold out - will be on the shelves on the same day that FATALE #2 hits shelves, February 1. FATALE #2 has also gone back to press, and its second printing will be in stores on February 22. FATALE tells the story of Nicolas Lash, a modern-day reporter who stumbles on a secret that leads him down the darkest path imaginableâ€¦ to a seductive woman named Jo. She’s been on the run since 1935, entangled with a mobster who may be a monstrous immortal demon. As the stories of all the doomed men who have encountered Jo rise to the surface, Lash realizes that he too is caught in a deadly web. In addition to a riveting epic that blends noir and horror, each issue of FATALE also includes an essay on the history of horror of by renowned literary historian Jess Nevins. 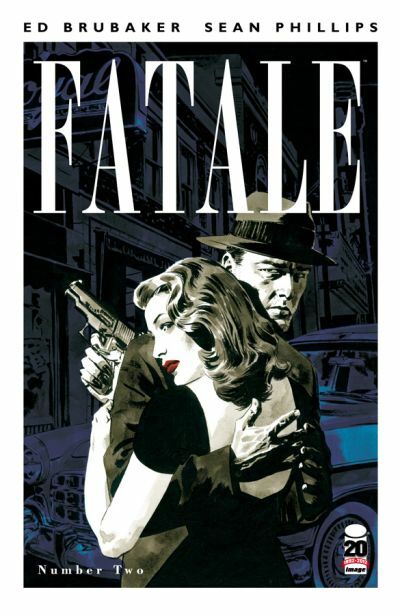 Reviews for FATALE #1 have hailed it as another superlative work by the creative team of Brubaker and Phillips. FATALE #1 and #2, 32-page full-color noir horror comic books priced at $3.50 each, are on sale from February 1 until supplies run out. A third printing of FATALE #1 (NOV118214) and a second printing of FATALE #2 (NOV118215) are available to order now, and will go on sale February 22.